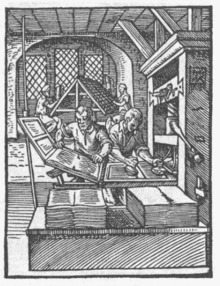 In typesetting, a forme (or form) is imposed by a stoneman working on a flat imposition stone when he assembles the loose components of a page (or number of simultaneously printed pages) into a locked arrangement, inside a chase, ready for printing. ↑ Ryder, John (1957). Printing for Pleasure. 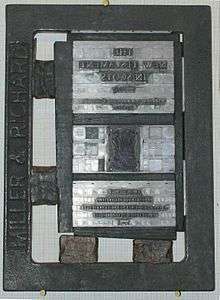 London: The English Universities Press Ltd. This article is issued from Wikipedia - version of the 1/28/2015. The text is available under the Creative Commons Attribution/Share Alike but additional terms may apply for the media files.